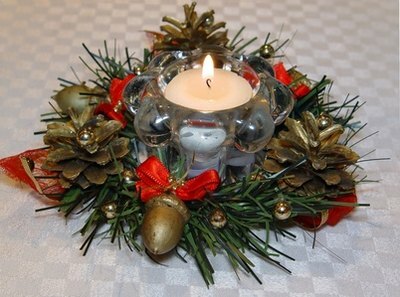 In the Christian tradition, the season of Advent begins on the fourth Sunday before Christmas Day. It is celebrated each Sunday leading up to Christmas Eve. According to Catholic Online, "the word Advent derives from the Latin word meaning coming," suggesting the celebratory nature of the holiday as Christians anticipate Christ's birthday. However, there is more to Advent than simply getting ready for the party. There is evidence of pre-Christian traditions using a wheel or wreath lit by candles in the mid-winter season as a means of ensuring the coming of the spring and the sunshine. William Saunders indicates that these traditions had already been fully adopted by the Christian faith by the Middle Ages. "By 1600, both Catholics and Lutherans had more formal practices surrounding the Advent wreath," he says. 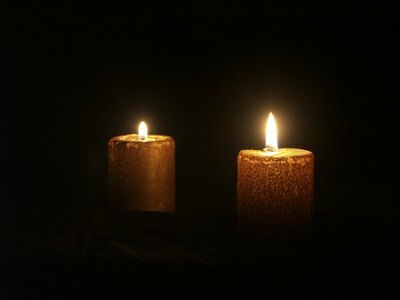 Traditionally, Advent was considered a time of fasting as a means of reminding believers of the despair of the world prior to the coming of Christ. 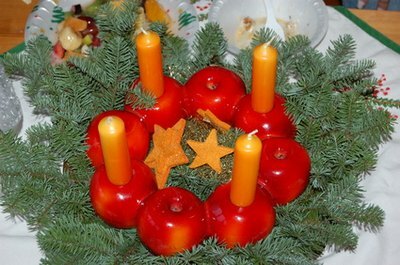 Supporting the idea that the origins of the Advent wreath sprang from a much older tradition is the symbolism of the wreath. The shape of the circle has been used since prehistoric times to symbolize the cycle of the seasons, but has also been used to symbolize the all-encompassing power of God. Hermes Trismegistus once said, "God is a circle whose center is everywhere and whose circumference is nowhere." 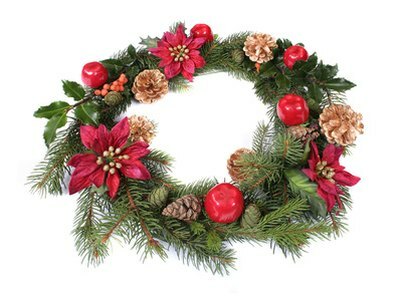 Beyond this ancient symbolism of shape, the wreath is usually made of fresh evergreen branches and pine cones or berries, symbolizing the everlasting life of the spirit and the rebirth after death. Each of the four candles used has special meaning, and specific verses are read with the lighting of each one. Each candle is supposed to represent a thousand-year period dating from the beginning of the Christian story (Adam and Eve) to the birth of Jesus Christ. The first candle honors the patriarchs, and is burned through the first Sunday dinner. The second candle is lit along with the first on the second Sunday, and honors the prophets and the promises of God. The third candle is lit on the third Sunday (along with the first two), and celebrates St. John and the coming of the light. The fourth candle is lit for Mary on the final Sunday. The colors of Advent are much different from what we expect for Christmas. 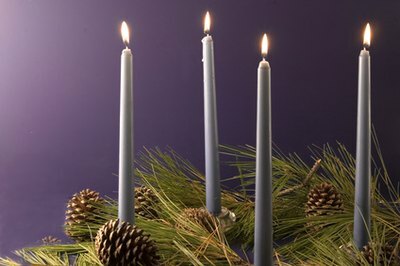 The traditional colors of the Advent candles are purple and pink, unevenly distributed. Three of the candles are purple and one candle is pink. According to Saunders, "The purple candles in particular symbolize the prayer, penance, and preparatory sacrifices and good works undertaken at this time." The pink candle is lit on the third Sunday, which is called Gaudete Sunday, as a symbol of rejoicing at the coming of Christ. As is expected in many holiday traditions, the observance of Advent has been modified over the years. The colors of the candles can change, most frequently changing the purple candles to blue to mark the season as different from Lent. 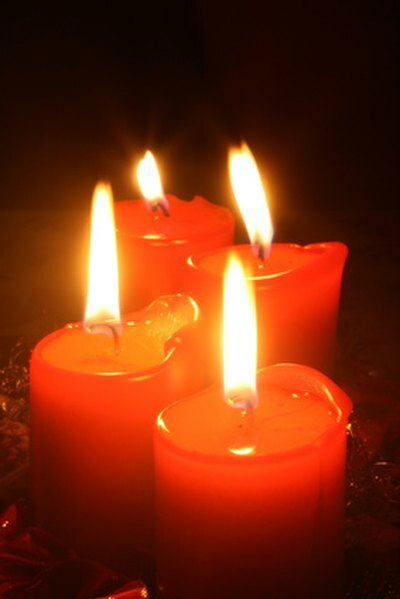 However, one candle is typically marked as different by using another color. A fifth candle is sometimes added as well. This one goes in the center of the ring and is usually white, to represent Christ himself, and it is lit on Christmas Eve.